Children's Publisher Goops Unlimited and Guatemalan Nonprofit "Help Me Paint My Future" are partnering for the release of a children's book based on a popular Guatemalan Folktale from San Pedro la Laguna. 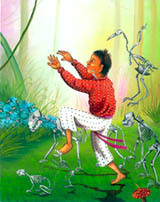 April 27, 2012 - PRLog -- Guatemalan Nonprofit organization "Help Me Paint My Future" will release their new children's book The Night The Animals Danced in partnership with the children's publishing company Goops Unlimited May 15th, 2012. With illustrations by brothers Jose and Henry Mendez, managing directors of the nonprofit, the team hopes to raise awareness of the organization that benefits children from the small Guatemalan village of San Pedro la Laguna. While working in their gallery in San Pedro la Laguna, painters Jose & Henry Mendez found many of the neighborhood children were interested in spending time in their gallery and learning to paint. In spending time with these children, the brothers learned many of them were without active fathers, due to death, divorce or alcoholism. Additionally, many of their mothers were struggling to raise these children on minimal resources. They created the nonprofit Help Me Paint My Future in 1998 in an effort to help these children and families. In addition to donations, the project is funded by 20% of all artwork sales from the brothers' gallery. The brothers offer classes in drawing and painting that are given every Saturday morning, where nutritional meals are provided. Every six weeks the mothers are provided with a basket of basic foodstuffs, as well as additional help with clothing and school supplies. Jose and Henry Mendez are hoping the book's release in the United States will provide visibility and much needed support for their program. Nicholas Beatty, Managing Director of Goops Unlimited, states, "We are very excited to be working with an organization that does great things for the children they serve. The Mendez brothers have proven their intentions are of the purest nature, as evidenced by the thousands of hours they have devoted to their organization. My hope is this they will find a new level of support with the release of their book in the US." The Night the Animals Danced is published by Goops Unlimited, in partnership with Help Me Paint My Future, and will be available May 15th, 2012. Visit TheGoops.com for more information.